The list of scenes in your project. You can select one or several scenes in this list, and decide to save the selected scenes into their own project. 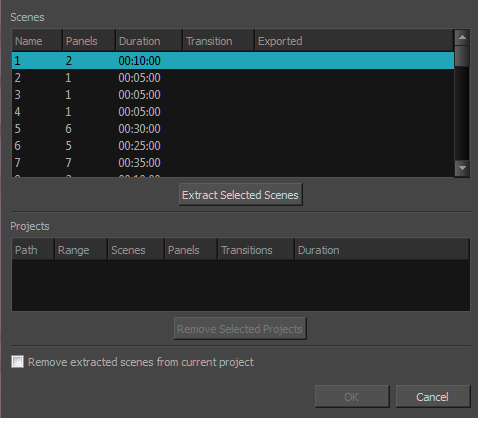 Prompts you to select the location and project name in which to save the scenes that are selected in the Scenes list. Once you are done, a new item containing the range of scenes that you selected will be added to the Projects list below. NOTE This adds a project to extract to the list of projects, but the projects are not actually extracted until you click the OK button. Displays the list of projects which you have chosen to extract. This list will contain a new item every time you select scenes in the Scenes list, then choose a location and name for them with the Extract Selected Scenes button. Removes the project that is currently selected in the Projects list from the list. Use this button if you made a mistake in the scenes and projects you want to extract and need to try again. Removes the extracted scenes from the project. If you want to keep the entire storyboard project intact as a master project, uncheck this option.